When the heart pumps blood into arteries then it creates blood pressure or BP. Whenever you notice the blood pressure reading, then it comes into a set of two digits, means 120/80 (read as normal blood pressure) in which it represented as systolic / diastolic blood pressure. Systolic blood pressure is the pressure in the arteries that the heart contracts and pumps the blood into the organs, where as the diastolic blood pressure is the pressure in the arteries when this heart relaxes after contraction. If the person who has systolic blood pressure in between 90 – 120 mm Hg and diastolic blood pressure between 60 – 80 mm Hg then the person is a healthy adult. Or if this BP goes above 130/80 then it is termed as high blood pressure or hypertension and if this pressure falls lower than 90/60 then it is termed as low blood pressure or hypotension. 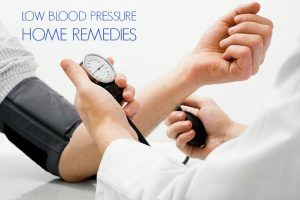 Low blood pressure or hypotension is a health problem which occurs when a person’s blood pressure is low and it is a condition in which the blood is not able to transfer the oxygen and other essential nutrients to all the vital organs and this in turn makes the organs like heart, brain, kidneys, etc. not to function properly and thereby get damaged either temporarily or permanently. So it would be more effective to keep the blood pressure at normal level for not only protecting the vital organs in the body but also for preventing the shock of life threatening problems, as steady low blood pressure will definitely cause fail to the functionality of vital organs. Dizziness, laziness, fatigue, nausea, fainting, lack of concentration, depression, blurred vision, palpitations, thirst, difficulty breathing, cold, pale and clammy skin are some of the symptoms of this low blood pressure. This hypotension is generally caused due to any of these reasons like prolonged bed rest, dehydration, stress and anxiety, decrease in blood volume, pregnancy, severe infections, neurological problems, nutritional deficiencies, severe allergic reaction, endocrine disorders, heart problems, etc. Or usage of certain medications like beta blockers, alpha blockers, anti – depressants, diuretics and others will also cause low blood pressure. So consult the doctor to discuss about the low blood pressure before using any of these medications. Listed below home remedies and tips are very effective in treating the low blood pressure and thus helps you to get cured from the problem in natural way. These home remedies are natural and safe to use for treating the low blood pressure at home. But it would be more effective if you find out the exact reason behind this low blood pressure and then using the remedy according to it is more effective. Whenever you increase the salt intake, then more liquid gets into the body which in turn causes raise in the blood pressure. So when you feel that your blood pressure goes down, then immediately have a glass of water by adding salt in it to increase the blood pressure quickly. Increase the salt intake in your daily diet, if you’re suffering from this low blood pressure. But make sure to consult doctor before increasing the salt in the daily diet for the people whose who are suffering from the heart and kidney problems. Even the pregnant women should also avoid taking excess salt in their diet. Take a glass of water (prefer lukewarm water) and add salt in it. Stir it well and have this salt water to raise the blood pressure which is lowered. Or you can also add little of sugar in it and this turns as an oral rehydration solution. Continue drinking this salt water daily until get relief from the low blood pressure and avoid following this remedy after the blood pressure reached to normal or else it causes some other health problems. Ginger is an herbal remedy which is widely used to treat both high and low blood pressures. It has many beneficial compounds that includes certain powerful anti – oxidants and plant chemicals like shogaol, gingerol and zingerone which helps to prevent the fluctuations in the blood pressure levels. This ginger also contains anti – clotting, anti – inflammatory, anti – spasmodic and many other useful properties which help to stimulate the blood circulation and thus increases the blood flow to have proper blood pressure. Here is the recipe on how to make this ginger tea for preventing the low blood pressure. Take a pot and place this grated ginger in it. Then pour boiling water over this grated ginger in that pot. Cover it and allow it to steep for about 10 – 15 minutes. Now strain the tea and drink this ginger tea to get relief from the low blood pressure. Continue drinking this ginger tea daily for once or twice to stabilize the blood pressure levels. Licorice is an herbal remedy used to raise the blood pressure. Glycerrhizin is an active ingredient in licorice root in which it is a sweet tasting compound and acts similar to steroid. This will increase the amount of aldosterone hormone in the body which in turn retains the sodium and eliminates the potassium in the body. We all know that sodium will easily raise the blood pressure to get relief from the low blood pressure. Here is the recipe on how to make licorice tea for preventing the low blood pressure. Take a pot and place this licorice herb in it. Then pour hot water over it and cover it. Allow it to steep for about 5 – 7 minutes. Now strain the tea to a cup with the help of a strainer or sieve. Drink this tea to raise your lowered blood pressure levels. Daily intake of this licorice tea will definitely help you to get rid of the low blood pressure. Or you can also take about 400 – 500 mg of licorice root capsules regularly for few days until you cleared these fluctuations in blood pressure levels. This causes water retention due to the sodium content in it. It causes deficiency in potassium in the body which in turn gives rises to many health complications, if used for a longer time. People who are suffering from diabetes or heart problem should have to consult the doctor before using this licorice. Rosemary is another beneficial herb for treating low blood pressure. This works excellently by stimulating the central nervous system to improve the blood circulation. In olden days, people are using this rosemary that are infused in white wine for regulating the blood pressure, blood circulation and headaches that results from these conditions. But now in these days, people uses rosemary ointment to massage the chest and thus to raise the blood pressure. So try to make your own rosemary infused oil for treating this low blood pressure. Take a jar and place these dried rosemary leaves in it. Then pour olive oil over it and make sure that the leaves have to be covered completely with this oil. Place this jar by keeping its lid in such a place where it is in sun like on window sill. Allow it to sit in that place for 2 – 3 days. Now take out the oil and strain it into another jar and cover it with a lid. Take out the oil and apply this on the chest. Massage it gently for few minutes with this oil to get relief from the low blood pressure. Continue doing this oil application daily until you get complete cure from the low blood pressure. Or take up to 10 ml of the rosemary tincture everyday to raise the blood pressure. Or else you can also add 3 – 5 drops of rosemary essential oil in the diffuser to get aromatherapy benefits. There are certain herbs that have the capability to raise or lower the blood pressure with a main function of regulating the blood pressure levels. Hawthorn is one among those herbs which helps to regulate the blood pressure very effectively. It contains certain antioxidants like oligomeric proanthocyanidins (OPCs) and quercetin that helps to counter the damage caused from the free radicals which in turn leads to heart diseases. This OPCs in herb helps to strengthen the blood circulation by dilating the blood vessels, improves the blood flow and finally protects the blood vessels from the damage. Some studies also proved that taking this hawthorn will help to improve the heart failure symptoms which is a similar situation to that of low blood pressure at decreased levels. Follow this recipe to know how to make hawthorn tea for stabilizing the blood pressure. Take a pot and place these hawthorn berries in it. Then pour boiling water over these berries in that pot. Now cover it and allow it to steep for about 10 – 15 minutes. Strain the tea with the help of strainer into a cup. Drink this tea to regulate the blood pressure. Or you can also use hawthorn leaves and flowers to make tea in the same way. Regularize drinking this hawthorn tea to get rid of the low blood pressure levels. Indian spikenard or jatamansi is an herbal remedy that was widely used by Ayurveda to raise the low blood pressure. This herb contains certain alkaloids and essential oils which in turn give the stimulant quality that can stabilize the blood pressure. This also acts as good cardiac stimulant that treats the heart palpitation. You can use this Indian spikenard in the below mentioned two ways to raise the blood pressure. Take a small bowl and add this Indian spikenard powder, a little of both camphor and cinnamon to it. Stir all the ingredients to make a fine paste. Consume this paste to get relief from the low blood pressure. Continue taking this herbal paste daily until you stabilize the blood pressure. Take a pot and place this jatamansi herb in it. Then pour boiling water over this herb in that pot. Cover it and allow it to steep for about 15 – 20 minutes. Strain this decoction into a cup and have this to regulate the blood pressure. Do this process of consuming this decoction for thrice a day on daily basis to get relief from the low blood pressure. Rose geranium using is referred to a pleasant fragrant way to regulate the blood pressure levels properly. For this, you have to find or grow a rose geranium plant or else get its essential oil for treating this problem. This rose geranium has many properties like antiseptic, astringent and anti – depressant properties. It also helps to stop the bleeding and thus stimulate the adrenals and regulates the hormones. It is a traditional remedy for Africans used to treat internal bleeding and diarrhea. Hence you can use this rose geranium in any of these ways to raise your lowered blood pressure levels. First of all, sit calmly and sniff the fragrance of rose geranium plant. Just simply inhaling the scent of this rose geranium herb will definitely do wonders and this finally adjust the blood pressure by raising or lowering it. Do this twice daily until you get complete relief from the blood pressure problems. This process is especially useful for the people who are unable to find the rose geranium plant. First of all, buy this rose geranium essential oil. Then take a handkerchief or a cotton swab and pour few drops of this essential oil in it. Now sniff this to get relief from the low blood pressure. Continue doing this process daily to get stable blood pressure regularly. Take this rose geranium essential oil and pour this oil into your bath water. Stir it well and soak in this water or take your bath with this oil water. Do this oil bath daily to prevent the fluctuations in the blood pressure and to have stable blood pressure levels regularly. Most of the people think that this aniseed is best for people who have high blood pressure but it actually helps to increase the blood pressure. The reason behind this is due to its nutritious contents that include iron, calcium, potassium, manganese, copper, magnesium and zinc which may increase the potassium and iron levels in the body that helps to raise the blood pressure. Aniseeds has good source of some essential B – complex vitamins such as riboflavin, pyridoxine, thiamin and niacin. The link between the low blood pressure and B vitamin is that when the body is not getting enough of vitamin B – 12 or folate then it causes anemia and as a result the blood pressure will drop tremendously. So its better to have vitamin B supplements of food and aniseeds are one among the B vitamin Rich food. Hence daily intake of this aniseeds will help to increase the blood pressure. Here are few ways that explains how to use this aniseed to get relief from the low blood pressure. Take few aniseeds and use this while cooking. This is considered as a great spice that used in Asian cuisine especially for flavor. Continue using this aniseed to raise the blood pressure. Take few aniseeds and use them to bake breads and cookies. Have this to get increase your blood pressure levels. Regularize the intake of aniseed baked breads or cookies will help to get complete raise in blood pressure and thus helps to stable the BP levels for perfect health. Take a pot and pour these aniseeds in it. Then pour hot water over these seeds. Allow it to steep it for about 5 – 10 minutes. Now strain the tea into a cup and have this tea to get rid of the problem. For more effective and quick results, you have to drink this aniseed tea for once daily until you stabilized the blood pressure levels. Aniseed has another property that helps for better digestion of the food without any indigestion. Have this aniseeds and just chew them after completing your meals. Regularize the intake of this aniseed after having the meals to get proper digestion and also to maintain stable blood pressure. Motherwort is an effective herbal remedy that has certain compounds like alkaloids, flavonoids, caffeic acid and tannins. Caffeic acid is not related to caffeine but it is an anti – oxidant that has anti – fatigue component. Hence this herb is considered as best for heart and nerves heath, as it cures the heart palpitations which was indicated as fast or irregular heartbeats. This also cures the weakened heart. It has mild sedative and anti – spasmodic properties but make sure that this herb is detrimental for the people those you are suffering with high blood pressure. You can use this motherwort herb in both infusion and tincture ways to get relief from the low blood pressure. But here is the recipe on how to make this motherwort tea to get rid of the problem. Take a pot and place this herb in that pot. Now cover it and allow it to steep for about 15 – 20 minutes. Finally strain the tea to a cup with the help of sieve or strainer. Daily intake of this motherwort tea will help you to regulate the blood pressure levels. Water is very important for every organ for doing its normal and regular functionality. Hence the main cause for this low blood pressure is the loss of intravascular fluids in the body. In general, our blood vessels have fluid space which is made up of blood cells and serum. Serum contains water, electrolytes, chemicals, etc. But when the total volume in intravascular space and the space that inside the blood vessels decreases then it surely causes low blood pressure. All this can be done due to dehydration and the internal bleeding. We all know that this dehydration is caused due to less supply of fluids to the body, profuse sweating. So to increase the lowered blood pressure, you have to drink a lot of water and other fluids such as herbal teas, fruit or vegetable juices, eating of fruits which have high water content, etc. as this will clears the dehydration and thereby low blood pressure. Ginseng is widely used as Chinese medicine for treating various health problems. It also referred to as adaptogen (in certain times) which is a substance that helps the body to cope up with mental or physical stress. It also has anti – oxidants that help to get rid of the free radicals, as these free radicals will result in heart diseases and some other health problems. Many experts in these days, believe that this ginseng is also effective as same as ginger in treating both high and low blood pressures. Here is the recipe on how to make ginseng tea to get rid of the low blood pressure. Take a pot and place this sliced ginseng root in it. Then pour boiling water over this root in that pot. Cover this and let it steep for about 15 – 25 minutes. Now strain the mixture and drink this tea to get relief from the problem. Daily intake of this tea will definitely help you to get complete relief from the low blood pressure. Caffeine also helps you to increase the blood pressure dramatically. Even though the exact reason of this caffeine affect on blood pressure is not known still but many experts says that this caffeine has the capability of blocking certain hormones that keeps this arteries widened. When once these arteries are narrow down, then the blood pressure levels increase quickly. Another reason is that this caffeine will work on the adrenal gland and this in turn helps to release more of adrenaline that finally result in increased blood pressure. So whatever the reason is, caffeinated drinks will raise the blood pressure. Hence have 2 – 3 cups of coffee per day will raise the systolic pressure by up to 3 – 14 mm Hg and diastolic pressure by 4 – 13 mm Hg. So have the below mentioned some caffeinated beverages daily to raise the blood pressure. Intake of too much of caffeine will cause some health problems. Many experts says that it would be better to have caffeine up to 400 mg is considered as safe limit for healthy adults. So never ever exceed 4 cups of brewed coffee or 2 energy shot drinks. Basil is another Ayurvedic remedy for treating this low blood pressure. It is rich in vitamin C, potassium, magnesium and pantothenic acid that helps to stabilize the blood pressure. This also helps to balance the mind and thus decreases all your stress levels to get normal blood pressure. Here is the recipe on how to make the basil juice to get relief from the low pressure on the blood. Take fresh and finely washed basil leaves and crush them finely. Place this crushed basil leaves on the sieve and squeeze it to extract its juice. Pour this juice in water and stir it well. Or else place these leaves in a juicer and pour some water in it. Then add raw honey to it and mix it well. Drink this basil juice in the morning on an empty stomach. Drink this juice once daily in the morning to raise the blood pressure and to have perfect health. Take fresh basil leaves and wash it off properly. Place these leaves in your mouth and start chewing them in the morning with an empty stomach. Do this chewing process daily in the morning time on an empty stomach to get rid of the low blood pressure. Siberian ginseng is a different one from the Asian or American (Panax) ginseng. It is also termed as adaptogen that helps to strengthen the body and increases the general resistance to stress. This is used effectively for heart problems and high blood pressure and low blood pressure problems. You can make tea with this Siberian ginseng just like the same process as ginseng. But make sure to consult your doctor or physician before taking any of these herb for treating the blood pressure problem. First of all, take a pan and place this sliced Siberian ginseng root in it. Then pour this hot water over this root in that pan. Strain this tea in a cup and have this to get relief from the low blood pressure. Daily consumption is Siberian ginseng tea will help you to maintain stable blood pressure. Generally, if you start your day with a fresh carrot juice by mixing it with honey will help you to get relieved from the low blood pressure. This juice helps to improve the blood circulation and thus regulates the blood pressure levels. Take carrot juice and add carrot juice to it. Stir it well and drink this to fend off the low blood pressure. Continue drinking this for twice daily i.e. once in the morning and once in the evening with an empty stomach until you cleared the fluctuations in the blood pressure. Lemon juice is very effective for not only treating high blood pressure but also for low blood pressure, particularly in the case if it is caused due to dehydration. This lemon juice helps to energize the body by stimulating the liver function and also aids in proper digestion. Here are few ways that explains you on how to use this lemon juice for treating the low blood pressure. Take freshly squeezed lemon juice and pour this in water. Then add a little of sugar and salt to it. Stir it well and drink this lemon juice to stabilize the blood pressure. Continue drinking this lemon juice once daily to get complete relief from blood pressure (either high or low). Take sugarcane juice and add freshly squeezed lemon juice in it. Then add a pinch of salt in it and stir it well. Drink this lemon juice mixed sugar cane juice to cure the low blood pressure. Repeat the same process regularly to prevent the low blood pressure. Scotch broom is an herbal remedy for treating the blood pressure problems. The flowers and aerial parts of this broom plant are also used as an effective medicine for treating various problems like poor circulations, low blood pressure, heart problems and irregular heartbeats. This herb has certain chemicals that increases the flow of urine and thus affect the heart rhythm. Tyramine chemical is the main reason that causing this raise in blood pressure and intake of this chemical in large amounts can raise the blood pressure quickly and this leads to high blood pressure. But the body has the capability to break down this tyramine naturally and thus reduces the high blood pressure. Here is the recipe that explains you on how to make this scotch broom tea to get relief from low blood pressure. Take a pot and place the scotch broom tops in that pot. Then pour hot or boiling water onto this broom tops. Let it steep for about 15 – 20 minutes. Strain it and drink this tea to raise the blood pressure levels. Continue drinking this scotch broom tea to stabilize the blood pressure. Raisins are Ayurvedic remedy used to treat the hypotension naturally. Regular intake of this raisin will help to maintain the normal blood pressure levels by supporting with the adrenal glands functionality. Take a bowl and pour water in it. Then place these raisins in it and cover it properly. Allow it to soak for overnight without disturbing it. In the next morning, you have to eat these soaked raisins one at a time with an empty stomach. Now you have to drink that raisins soaked water on an empty stomach after eating the raisins. But make sure that not to eat or drink anything for an hour after drinking this water. Continue doing this process for at least few weeks or for 1 – 2 months. This almonds and milk is a combination process that is very effective in treating the low blood pressure. This process raises the blood pressure by acting up on the adrenal glands and stabilizes the blood pressure. Here is the recipe which you have to follow them to raise the blood pressure. Take a small bowl and place the almonds in it. Then pour water in it and cover the bowl properly. Allow it to soak for overnight. In the next morning, you have to take out the almonds and peel it off their skin. Place these almonds in a blender or grinder and make it a smooth paste. Now place the milk on the stove or heat and boil it. Add this almond paste into this milk and stir it well. Boil this paste in that milk for few minutes and then turn off the heat. Drink this cup of almond milk in the morning to raise the blood sugar levels. Continue doing this process daily in the morning time to get complete relief from the problem. Intake of poor diet and malnutrition food will definitely leads to the improper production of blood (results in anemia) and also the deficiency of few vitamins (especially vitamin B) and minerals also cause low blood pressure. So to get rid of all these problems that finally results in low blood pressure, is that you have to take proper diet daily. Have balanced and healthy food in your daily diet which includes high of protein, vitamin C and vitamin B complex such as lean protein, plenty of fresh and organic fruits and vegetables, dairy products, eggs, citrus fruits and complex carbohydrates. All these helps to stabilize the blood pressure. Its always better to eat 5 – 6 small and frequent meals rather than 2 – 3 large meals in a day. This not only helps for proper digestion by well absorption of all the nutrients by the body but also regulates the blood pressure. Drinking a lot of water along with other healthy liquids or fluids such as coconut water, herbal teas, fruit and vegetable juices, etc. will help for proper blood circulation by removing the toxins in the body and this in turn results in normal blood pressure without any high or low pressures in the blood. You have to start increasing the intake salt in the daily dishes to raise the sodium levels and thereby to increase the low blood pressure. Include certain foods like carrots, beet roots, papaya, etc. which has the essential nutrients that are required by the body to combat the low blood pressure. Stop drinking alcohol (and its beverages) or else limit it to prevent the dehydration which in turn results in lowering the blood pressure. Avoid the intake of high carbohydrate foods like pasta, rice, bread, potatoes, etc. in your diet as it will lowers the blood pressure and may the condition worse. Regular intake of a cup of raw beetroot juice for twice a day on daily basis will help you to get stabilized blood pressure and thereby health. Intake of dark chocolate and uncooked cottage cheese is also considered as effective for treating the low blood pressure. Have some pomegranate which is proved as a great fruit for treating the low blood pressure. You can eat the seeds or crush them to have in juice form also. Even intake of garlic also help you to get rid of the problem, all this you have to do is eat 2 raw garlic cloves at night time at least 1 hour before going to bed or else you can add this garlic cloves in your food. Here are some simple and effective tips that helps you a lot in treating the low blood pressure and thus to maintain the normal blood pressure levels without any fluctuations in it. Rest is very important to overcome this low blood pressure. We all know that low blood pressure is nothing but getting less amount of blood to the vital organs for its functions, so you definitely need to take a break time in your regular works and take rest for few minutes. Continue this thorough out the day on daily basis till you cleared this fluctuations in the blood pressure. Avoid standing (or sitting) for longer period as this will hamper the proper blood circulation in the feet and also in certain times, makes you feel fatigue. Remember to sit down or lie down whenever you feel nauseated or if you’re in a feeling of faint to get relief from it and also from low blood pressure. Always wear compression socks or stockings especially after consulting the doctor to prevent the blood from pooling in the legs and also to have proper blood circulation throughout the body. Daily do some light exercises like walking, swimming, cycling, etc. which help to promote the proper blood flow to all over the body and thus helps to control the low blood pressure. Whenever you want to stand up from either sitting or lying positions, then you have to do this slowly. Or else if you stand up suddenly, then you may feel dizzy and also fall down unconsciously. If you sit or stand from the lying position, then you may feel some low blood pressure symptoms why because standing generally causes the blood to rush towards the lower body parts. Or if you already suffering from very low blood pressure, then your condition becomes very badly. Remember that if you feel fainting, lightheadedness or dizziness up on standing due to this low blood pressure, then it is termed as orthostatic hypotension. You can also eat 4 – 5 almonds, 10 – 15 black currants and 15 – 20 peanuts along with a glass of milk regularly to get relief from the low blood pressure. Make sure to consult the doctor to know whether any of medications that you’re using are causing the fluctuations in the blood pressure. It would be better to check your blood pressure regularly even though you’re healthy and use the remedies to stabilize the blood pressure. Have hot Epsom bath regularly to get relax the body from the stress and also to raise the blood pressure levels. But remember that not to have the prolonged hot water showers or spas in your daily routine. Avoid over straining like lifting heavy weights, straining while on the toilets, doing vigorous exercises or any other work by straining the body. It would be effective if you wear compression stockings that helps to reduce the pooling of the blood into the legs. This elastic stocking that covers the calf and thigh will help to restrict the blood flow to the legs and this in turn helps to keep more blood in the upper body. Always elevate your head at night time on the bed by placing the another pillow or bricks or blocks under the head placing position of the bed. Never ever take drugs for this low blood pressure before taking the meals. It would be better to avoid changing the positions suddenly as it also leads to fluctuations in the blood pressure. Also avoid standing or sitting position for longer period. Doing yoga, meditations will help you to get relief from the stress and makes you feel refreshed and relaxed and thus stabilizes the blood pressure. Even weight also causes low blood pressure. So, try to lose your weight, if you’re overweight by following strict diet and some herbal home remedies for weight loss. All these remedies and tips are natural and can help you to raise the blood pressure to stabilize the BP levels. But make sure to consult the doctor to know the exact reason and also the medications required to cure this problem and then follow these remedies to get complete control over the blood pressure. This is all about Home Remedies to get rid of the Low Blood Pressure. Hope you’ll follow these remedies and tips for treating the low blood pressure. Let me know which remedy worked well in treating the low blood pressure by sharing your experience with us. I saw most of your remedies are for low blood pressure. what can I use to prevent high blood pressure?